Iceland: What planet is this? It was 11pm but the sun still shone brightly in the midnight sky. A cool breeze took my breath away and danced through the air. 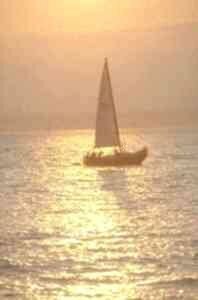 As soon as I had arrived I had found myself enamored by her enchanting beauty and mystical aura. For me, Iceland has always been a poignant symbol of my childhood fantasy and an inquisitive desire to explore the unknown. Alighting the aircraft I was once again a young boy gazing at a chalky Northern mass, captivated by a place known only to me as “Iceland”. When I told my friends I wanted to visit, they simply replied with a “why?” Misguided as it may be, they viewed Iceland as a barren wilderness of frozen icebergs and ferocious polar bears. In actual fact, Iceland’s only polar bear floated over on a treacherous journey of life and death, only to be unfortunately shot upon arrival! To quote the famous phrase: “Iceland is green and Greenland is ice”. The lush green terrain intertwines with cascading waterfalls, volcanic power, soaring glaciers, picturesque fjords and bubbling geysers. Iceland is a beautiful and savage representation of the world many million years ago, throbbing and pulsating with sheer natural energy at every turn. Exiting the doors of Keflavik airport and viewing the barren expanse of lava fields is like stepping out of your own personal time machine! The city that really doesn’t sleep! Iceland remains for the most part uninhabited and therefore the majority of the population is condensed into the authentic hub known as Reykjavik. I walked near the city pond and watched as the icy blonde beauties passed me by. The wooden houses were painted many colours and were surrounded by a rare mixture of bustling city life and peaceful bliss. I walked a little further and was greeted by the imposing figure of the Reykjavik church. The architecture pierced the skyline and resembled an alien spacecraft. The harbour fizzed with a maritime spark as navigators set sail and tourists embarked on their own personal whale watching expeditions. Without darkness the time simply withered away unsuspectingly. It was midnight and the city centre was anything but typical. Youngsters unable to drink cruised around in lavish cadillacs, blowing their horns and chanting unknown songs. It was as if the light was eternal and they were somehow perpetually trapped in time. The peace of the day transformed into the sinful pleasures of the Icelandic club culture. Weekends in Reykjavik are a hidden paradise for pleasure seekers. The people work all week to spend their earnings in an alcoholic blur of hedonism and fun. The darkness never comes and the music never ceases. Staying in the heart of Reykjavik was a surreal experience and a stark contrast to the country as a whole. First stop was the geothermal power plant where we learnt how the natural energy potential is harnessed. In actual fact, when taking a shower, you can still smell the odour of sulphur. The pipes are built on maneuverable hinges to counteract the daily seismic activity throughout the country. It was a fascinating insight into a truly amazing country. We soon arrived at the Skalholt church. The building has a strong historical and political past and its shape loomed ominously amidst the dark black clouds that hung directly above the structure. This was the prelude to the visual delights of Gulfoss. 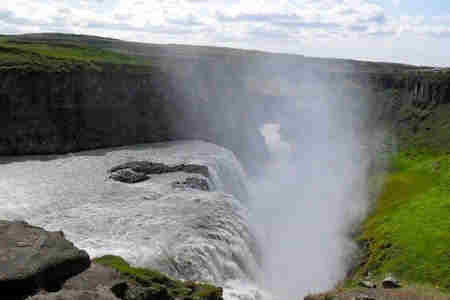 Gulfoss, also known as The Golden Falls, is Iceland’s largest and most spectacular waterfall. The sheer speed of the water flow made me feel tiny compared to the gilded splendor that drowned me. You could stand so close to the drop that it felt as though you were actually a feature immersed in the cascade. 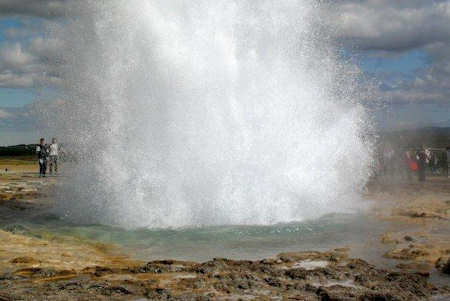 A visually stunning experience flowed into the site of the mighty geyser. Everybody waited in anticipation, cameras held tightly in their hands, waiting for that special moment. The tension was unbearable as the ground began to bubble incessantly. Within seconds the bubbles crystallized into an azure bubble of intense heat and warmed the sky in a powerful eruption of boiling water. From this point on I would never underestimate either the beauty or the force of nature ever again! A hitchhikers guide to the glacier! He was like no other horse I had seen, slowly cantering as his silvery mane swayed to and fro. Everything seemed in some way alien to us, whether it be the appearance of the wildlife or the forces of nature. Slowly but surely we progressed on our journey, meeting some fascinating characters along the way. First was the young guy who seemingly pulled us over. Strolling down the highway, he parked his car and asked us if we wanted a lift, so typical of the delightful warmth that is Icelandic hospitality. We talked about the poor quality Icelandic football league, discussed the difference between fish farming in Canada and Iceland, and he explained to us the economic bankruptcy of his home land. Next we found ourselves a lift from an Italian couple traveling the Icelandic countryside following a charity conference in Reykjavik. I discovered they had also studied at Bologna University and could practice my Italian skills a little along the way. In the distance we could see an immense waterfall nonchalantly cascading from the heady heights of the clouds. A rainbow ignited itself across the azure sky, as the waters collided with dynamic precision. Deciding to pull over, we ascended the rocky pathway and stood directly behind the free-falling velocity of the water. I could feel the misty spray against my skin and all at once I was one with nature. Without saying a word, the beaming smiles on our collective faces painted a poignant picture of momentary bliss. It was special. We parted ways with the couple in a quaint town called Vik. We investigated the black sandy beach in search of seal life and looked at the church that sat proudly, high amidst the verdant hillside. The mental image was like an idyllic postcard. It seemed that every time we turned our heads nature would surprise us with something more spectacular and awe-inspiring. Failing to get another lift we paid for a bus ride to a place called Skatafel. The driver listened to Icelandic folk music and operated a gear stick that was barely attached to the vehicle. It was a bumpy ride to say the least! 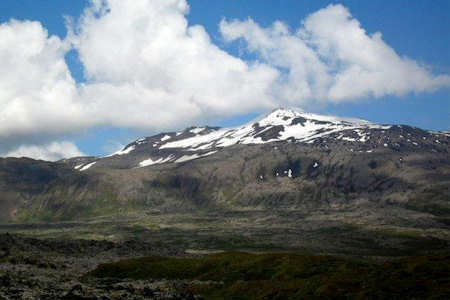 Skatafel is a national park and a focal point of glacial exploration. Trails led into the mountainside and various hikes departed from the main base of the campsite. The omnipresent light could not disguise the fact that the night was descending upon us and we had a problem. We had soaking wet, non-waterproof clothes from the freak barrage of rain that had just engulfed us. We had no tent and no prospects of accommodation. Vehicles no longer frequented the roads and we were essentially stranded in the middle of nowhere. We were victims of Iceland’s distinct isolation and tempestuous climate… we needed saving. Our saviors came in the form of three American girls from the deep south who also found themselves stranded in Skatafel. They did however have tents and they allowed us to camp with them for the night. My hands now felt numb as we found ourselves breaking into a desolate wooden barn and pitching a tent. Reminiscent of a horror film's cast, we huddled together in the marginal warmth of the cosy tent. The outcome if we had not met these girls? I choose not to speculate… Careless and naive as it may have been, we had achieved our adventure and met some rare and special companions in the process. Reverting back to the comfort and safety of the organized tour, I departed the next day for the Snaefellsnes national park. Thought to be one of the earth's seven energy spots and the mythical gateway to the centre of the earth, the glacial volcano was magic in its purest form. Along the way we stopped to absorb the immensity of the whale fjords and various rock formations, created over time through ancient volcanic activity. Whilst absorbing the energy we had the opportunity to drink from a natural spring. The water came directly from the ground and had a rusty orange coloration combined with a shockingly fizzy texture. Having never seen so much as a waterfall before, Iceland was continuing to take my breath away. On arrival we began to explore the national park and had time to appreciate the myriad of bird life and general wildlife from within this peninsular. I can remember standing on a jagged rock that was surrounded by exquisite pools of colour and laughing at the playful comedy of the animated seals as they wallowed in the muddy waters. The lava formations were a geological marvel and the glacier itself flaunted natural combination’s of colour I never knew existed. As we all stood at the bizarre and almost inexplicable statue of Thor, I stopped to observe the 85 year-old American lady that was part of my tour group. I do not believe in miracles but the natural energy had given her a youthful glow that astounded me. Truly magical. 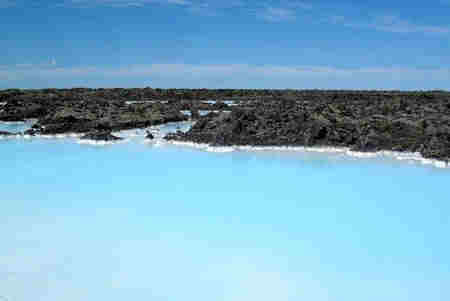 On departure day it was possible to combine the journey to the airport with a stop-off at the famous blue lagoon. The lagoon is in the middle of a lava field and as the bus approaches it appears an almost gritty, factory-like structure. As I drew closer I was obviously unprepared for the aqueous fairy tale that awaited. Surrounded by pitch black rocks, the warm pools of water were a milky blue that could not be captured on film. What I was seeing was other worldly, like being on the moon. Inside it was more like a hi-tech spa. I got changed and immersed myself into the reputedly healing waters of the blue lagoon. Even with a bar in the centre, it did not feel like a tourist trap. I felt as if it was my own personal space-age paradise that I wanted to share with the whole world! Exiting the hot water into the crisp midday breeze was both refreshing and at the same time invigorating. Leaving Iceland felt like leaving behind a magical world in which man and nature lived together in a hidden Scandinavian Utopia. Iceland was clean, safe and heart-warming. As I bid farewell I knew only one thing. One day I would once again return to this enchanted land that had so graciously dazzled me. If you enjoyed reading the above article then you will probably also enjoy Paris by Stewart Collins, and West Cork, Ireland, also in Europe, and our latest articles covering the Orinoco Delta, La Mata, Marbella and Beijing.